Treatment cream helps clear acnes pimples, helping to reduce size and redness. The benzoyl peroxide formula goes to the root of the acne pimples to help dry and clear them up. For the treatment and prevention of acne pimples. For external use only. Do not if you have very sensitive skin or are sensitive to benzoyl peroxide. When using this product avoid unnecessary sun exposure and use a sunscreen, avoid contact with eyes, lip and mouth, avoid contact with hair or dyed fabrics, including carpet and clothing which may be bleached by this product, with other topical acne medications, at the same time or immediately following use of this product, increased dryness or irritation of the skin may occur. If this occurs, only one medication should be used unless directed by a doctor. Skin irritation may occur, characterized by redness, burning, itching, peeling, or possibly swelling. More frequent use or higher concentrations may aggravate skin irritation. Mild irritation may be reduced by using the product less frequently or in a lower concentration. Stop use and ask a doctor if excessive skin irritation becomes severe. Cleanse the skin thoroughly before applying medication, cover the entire affected area with a thin layer one to three times a day, because excessive drying of the skin may occur, start with one application daily, then gradually increase to two or three times daily if needed or as directed by a doctor. If bothersome dryness or peeling occurs, reduce application to once a day or every other day. 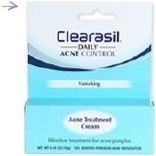 Use to prevent new pimples from forming. If going outside use a sunscreen. Allow Clearasil to dry, the follow directions in sunscreen labeling. If sensitivity develops, discontinue use of both products and ask a doctor. Aluminum Hydroxide,Bentonite, Carbomer, Glyceryl Stearate SE,Isopropyl Myristate, Methyparaben, PEG-12, Potassium Hydroxide, Propylene Glycol, Propylparaben, Water.